RG Herald: Local H.S. Students Honored by B.P. Local H.S. Students Honored by B.P. 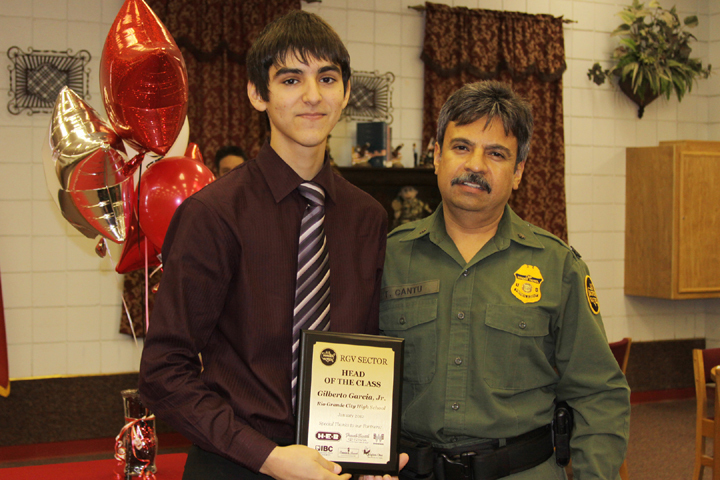 Rio Grande City High School Senior Gilberto Garcia, Jr. and RGCCISD Grulla High School Senior Dayali Garcia were named to U.S. Border Patrol Head Of Class Student by the RGV Sector Border Patrol in a ceremony Wednesday, January 18, 2012 at Rio Grande City High School.This program is an award that recognizes seniors in all Valley High Schools who demonstrate academic excellence. Gilberto Garcia, Jr. is the son of Mr. and Mrs. Gilberto Garcia. He will pursue a career in the dental industry and is ranked third in his class. Patricio is described as a gifted student and a leader by his teachers and peers. He is proud to say that he is at school by 7:00 a.m. every morning and always glad to assist his fellow classmates with homework. Dayali Garcia is the daughter of Mr. and Mrs. Eligio Garcia and plans to pursue a career in physical therapy and business administration. She is currently the top student in her graduating class. Dayali is a very dedicated young lady who enjoys doing school work as well as volunteering in many different organizations both in school and in the community. She is very grateful to her parents for all of their support. Irma Chapa-Border Patrol Spokesperson was the Mistress of Ceremony for the event. Agent Felix Cantu-Head Border Patrol Agent for the Rio Grande City Sector welcomed the parents and students and congratulated the students on their academic excellence. Mayor Ruben Villarreal was also present and welcomed the students and parents who were present. Mr. Adolfo Pena-Rio Grande City High School Principal addressed the students and commended them for their achievements, "education is the key that opens many doors," he said. La Joya and Mission High Schools Head of Class students were also present at the ceremony. Pictured Rio Grande City High School Senior Gilberto Garcia, Jr with Agent Felix Cantu and RGCCISD Grulla High School Senior Dayali Garcia and Agent Felix Cantu.